Salvation And Survival: Where Is Our Common Sense? First of all, what is common sense? We hear it talked about from the political stage quite often ... "common sense gun control", for instance. How do those two terms even exist in the same sentence? And where is the common sense in the claim that Dalia Mogahed, formerly Barack Obama’s adviser on Muslim affairs, made on The Daily Show, that wearing the hijab represented nothing more or less than the “privatization of women’s sexuality”. She insinuated that anyone who objected to this external symbolism of the Islamic faith are "those who want to objectify women as sexual commodities". And where is the common sense in Planned Parenthood's lawsuit against the Center for Medical Progress's (CMP) videos exposing their selling aborted baby body parts for profit? If the allegations are false, why not sue for slander or libel? Why is the lawsuit based on claiming that the recordings were obtained in violation of applicable State and Federal privacy laws? Does that sound like common sense to you? 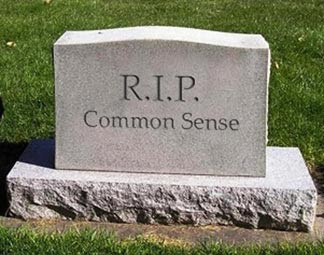 But, again, I need to define what "common sense" means to me. On a simple basis, I suppose I would define it as "a good or obvious cause to do something"; a logical, or practical reason to believe something or to act on something. But perhaps the best definition comes from Harriett Beecher Stowe, the American abolitionist and author: "Common sense is seeing things as they are; and doing things as they ought to be." Easier said than done in this society, where there appears to be no absolute truth -- we just manipulate and control matters to fit our own personal prejudices, and that's "our truth". Take for instance, the gun control issue. Does it make sense to call for more background checks or a ban on large magazines and the politically counterfeit term "assault" weapons ... when none of those laws have, or ever will, keep the bad guys from committing crimes or acts of terror? And there is no sense in the argument that “How can you say you’re pro-life and then own guns or join the NRA?” As Timothy Buchanan, wrote on Barbwire.com, "It’s quite simple. Because Christians realize that God makes a clear distinction between the spilling of innocent blood and killing in defense of one’s own life. Therefore, it is precisely because we value life that we are willing to take lawful and responsible steps to defend it." And here is where Buchanan, a former member of the U.S. Navy, applied his common sense ... While working for the Virginia State Police, he saw that campus police and troopers were powerless to stop the Virginia Tech murders because the shooter had chained and locked the doors to the building he was in from the inside. Even if they could have gotten the doors open a few inches, most police officers do not carry bolt-cutters with them, and the hinges of the doors are also on the inside. But what shocked him was that when the shooter was reloading one of his guns, the students simply cowered in a corner waiting to die. Unlike the heroic men on the plane that was heading toward Washington on September 11, 2001, no one stood up and said, “Let’s roll,” and tried to rush the shooter. They just cowered in a corner and waited to be killed. So, I ask, is there any good, or logical, or practical reason to limit the ability for any one of those victims to defend themselves in that scenario? Does more gun control make common sense now? And the same scrutiny can be applied to the common sense arguments for the wearing of the hijab and the Planned Parenthood lawsuit. There can be no basis to the argument that Westerners are insensitive to the Islamic tradition of the hijab because of their overt sexualization of women, while there is a refusal to shine a light on the persecution and death to women in the Middle East who refuse to wear the headscarf. Jihad Watch reports that as far back as 2007, jihadists killed 40 women in Iraq for “un-Islamic behavior" (translation: they were not wearing the hijab). And there are more cases of such murder and mistreatment of women that are never talked about. And yet we are expected to agree that it makes sense that Westerners just want to "objectify" women? And it's supposed to seem logical and make sense to us that Planned Parenthood should sue CMP not because they deny that they sold (and continue to sell) baby parts, but because PP just objects to how CMP went about proving that fact. So, therefore, they have a right to sue for damages. Never mind the fact that they are scared to death they will be defunded by Congress, and their donations are drying up, and they need to win this lawsuit to refill their coffers. Never mind all that --- this is just the logical next step and makes perfect sense. Bottom line... I'm afraid that we might have lost our ability to reason and see through the false arguments and the subterfuge and the distractions in order to clearly see the truth of any matter. Do we really spend time doing our own critical thinking? Or do we simply embrace whatever persuasive argument that appeals to our emotions, or is represented by a cultural icon or celebrity? Whose standard do we apply to determine our position on any given topic? Are there incontrovertible principles by which we judge another's argument or reasoning? Have you developed your own standards; or do you follow whatever is popular in the culture that day? Let's face it. As we have abandoned God's principles to listen to the lies of Satan, we have suffered a decline in every aspect of our lives. Our moral base has disintegrated; and we have lost our common sense. Our ability to reason according to God's guidelines has been replaced with whatever furthers our personal agenda... whether it be gun control, sharia law, or abortion. So what is your common sense telling you right now? Mine says there is no safe haven but God. He is the only standard by which I want to live my life, and I must abide in Him to stand against the threats headed my way. Anything else is false and destructive. 1 John 5:20 "And we know that the Son of God has come and has given us understanding, so that we may know Him who is true; and we are in Him who is true, in his Son Jesus Christ. He is the true God and eternal life."